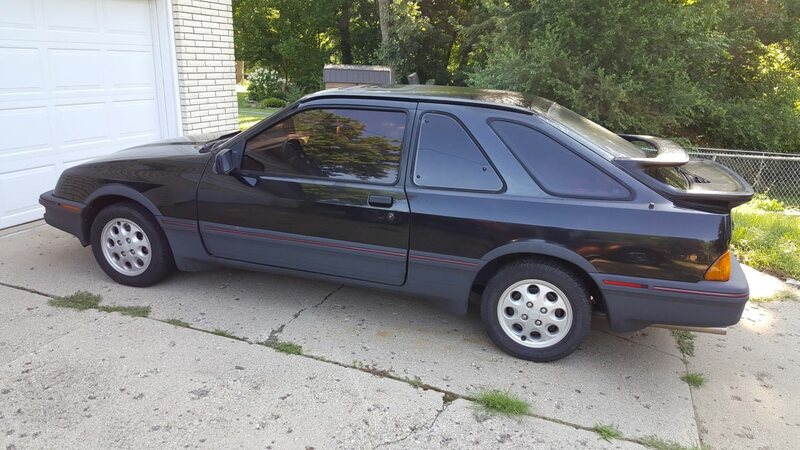 Hey everyone, I just acquired an 85 XR4Ti 5 speed from Mike at Merkur Depot a few weeks ago. Finally starting to dig into it. Here it is on the trailer and when it made it home. Overall its in pretty good shape, only a couple spots of surface rust, and some pretty typical undercar rust on the chassis, but nothing a little wire brush and POR won't cure. 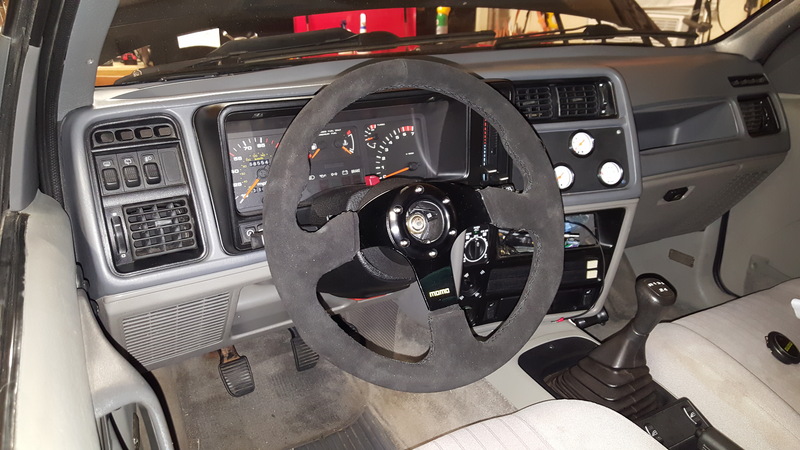 The interior is pretty clean for being 33 years old too. There's some sketchy wiring things going on though, so thats probably going to be my first project, along with fixing the steering boots, replacing tie rods, brakes/rotors/lines, and replacing the fuel hard lines, along with various other maintenance things (filters, fluids, etc). As is typical the oem temp gauge is dead, and I think the fuel gauge is questionable. I haven't really decided what to do with it yet, probably turn it into an AutoX/Track car. Anyways the real reasons for this post, I've been going thru the FAQs, service manual, etc. 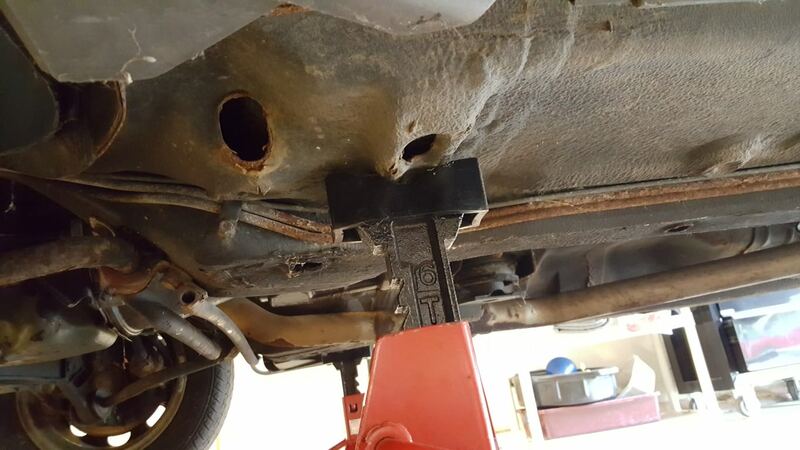 I am a little surprised I haven't been able to find any pics of a car actually on a jack stands. Based on the descriptions in some posts, I think I have this thing up on stands properly. I can see what they mean then they say these cars are a PITA to get up on stands. Are these the correct front/rear locations? They seem to hold up the car fine. It will probably be on stands for at least a month or two like this, so I want to make sure . Secondly, I'm going thru the underhood and undercar wiring, there's a couple wires that look like they corroded off their their fitting or harness. There is a super sketchy aftermarket fan thermostat setup that I don't think works over on the passenger side. I am guessing these two bare corroded wires are part of the original cooling fan harness? There's nothing connected to the fan temp (I think) sensor by the intake manifold. I can't find a connector in the harness anywhere near here, so I am guessing it corroded and broke off at some point. Is there a good source to buy pigtails? It seems like a lot of the factory connectors are gone (idle control, o2 sensor, etc). 3rd, Looks like the Neutral safety switch wires corroded off? It looks like the wires are still in the harness further up, guessing previous owner just bypassed this when it corroded off. Reverse lights still work. 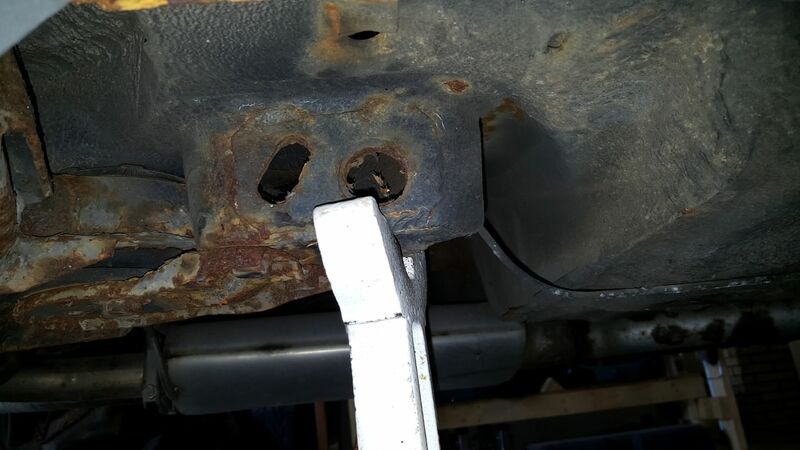 Anyone have any idea what sway bar mounting bracket this is? Its got a grease zerk, so it's aftermarket. 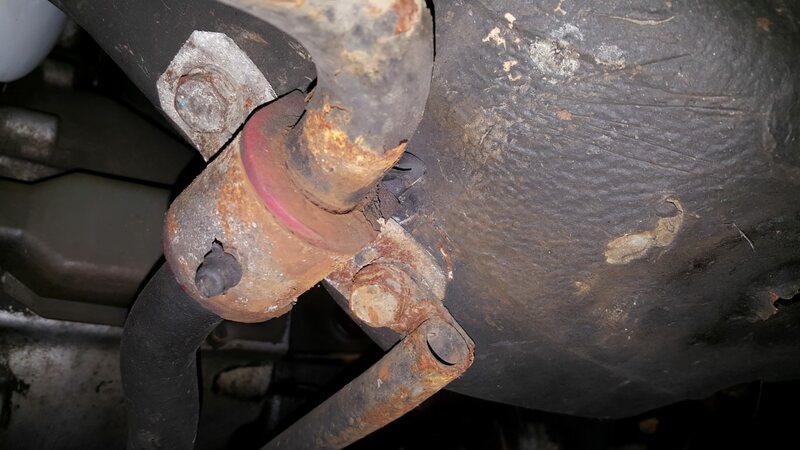 I am guessing this is a univeral poly bushing since he's got some uh "spacers" under it to make it work. Sketchy. Last, but not least, I get a little puddle of oil under the car after I drive. I dont think this is the pan seal or rear main seal, the oil is (or trans oil) is further back on transmission. Would these be in the input shaft seal that is probably leaking? There's not really any oil/grease on the output by the tail, its dry. 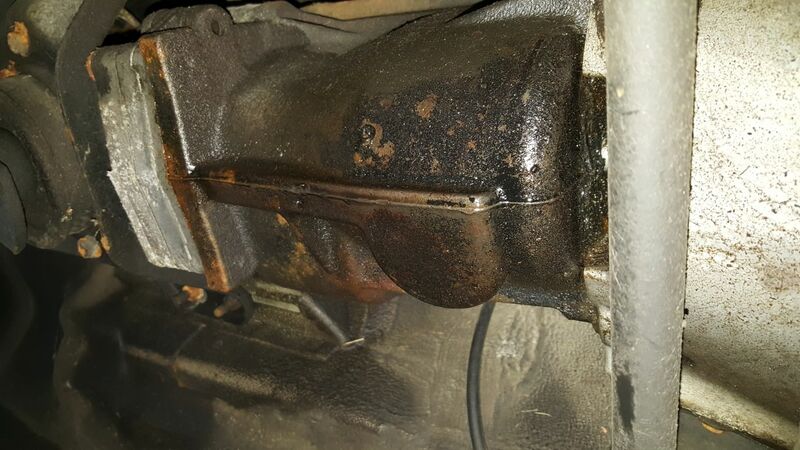 It is a little wet around the oil pan seal in some spots, but not like the bottom of the transmission here. Regardless of what seal it is, pretty much means a trans drop I assume or a T5 swap . Mike changed the head gasket and such before I got the car. I didn't see any oil on the valve cover. Not sure if that gasket was replaced, but I'm guessing it was since the head was off. Yep, valve cover gasket is new (rubber, not cork). The sway bar clamps and bushings are definitely some off-the-shelf universal pieces that need to go. The "rewired" reverse light switch does not appear to be the factory switch in there - probably the reason for the creative wiring. The NSS failure is common and the the easy fix is to just bypass it like the previous owner has. It will start while in gear now, but not too big of a deal. Jack points are the ones I use, for the most part. Yes, jacking this car up can be a PITA. It's funny you talk about "sketchy wiring," as to be candid, some of the factory wiring was a bit sketchy to begin with... and thirty years on, we could all benefit from upgrades and replacements. You have your priorities right! If the pcv is not the correct motorcraft one and/or broken you could be pushing out oil under boost. You can seal up some areas with that Indian Head gasket stuff, like bolts that go into the engine and leak oil under high boost. Rubber valve cover gasket is done so that should be good. Maybe put in exactly 5 quarts and check to see if the dipstick is correct. I can never keep all five in mine, it likes to get closer to the add oil mark then stay there. My dipstick doesn't pop out but sometimes oil comes out around the breather on the valve cover and out the front. Seems to do that more when I bump into the rev limiter. I have a lot of maintenance stuff I am planning to do, hoses, probably replace the radiator, pcv, replacing all the brake hoses, brake fluid, pads, rotors, fuel hard lines, fuel filters, fixing the cooling fan, replacing the chintzy autozone gauges, etc. I finally got the stubborn drums off today, big pain, pretty well stuck on there. Lots of fun to go. I did make one "needless" upgrade though. New steering wheel. 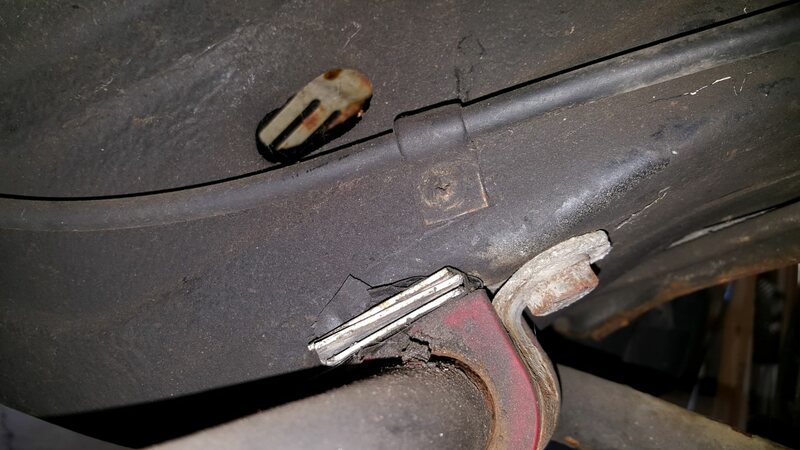 With regard to the rear drum brakes it might be that the previous owner used new rear shoes in it at some point and if I recall the XR4Ti was one of the cars that had a thick shoe (to the rear side I think) and a thinner one but after market brake shoes are equal thickness. This makes it hard to get the drum on and off. Just a a thought. I usually use a short piece of 2x4 size wood between a jack or a jack stand to have a softer surface against the car floor. No speaker hole. It has to be replaced. To this day I am amazed how much better the 87 on dashboards are for not cracking. They still get wavy over the years, but don't seem to crack much. AC Delco actually makes shoes with the staggered thickness and the right lever thing on the shoe.